3D data center floor map visualizations and thermal time-lapse video may seem like flashy "eye candy" aimed at impressing passers-by at tradeshows. However, when implemented as part of a comprehensive Data Center Infrastructure Management (DCIM) software solution, they provide useful, visually interesting ways to display power management and environmental monitoring information in your data center. They can even help you gain actionable insights to run your data centers more efficiently. Think we're just showing off? Schedule a one-on-one product demonstration with our DCIM experts to explore how 3D visualizations and time-lapse thermal video can provide insights about your data centers. 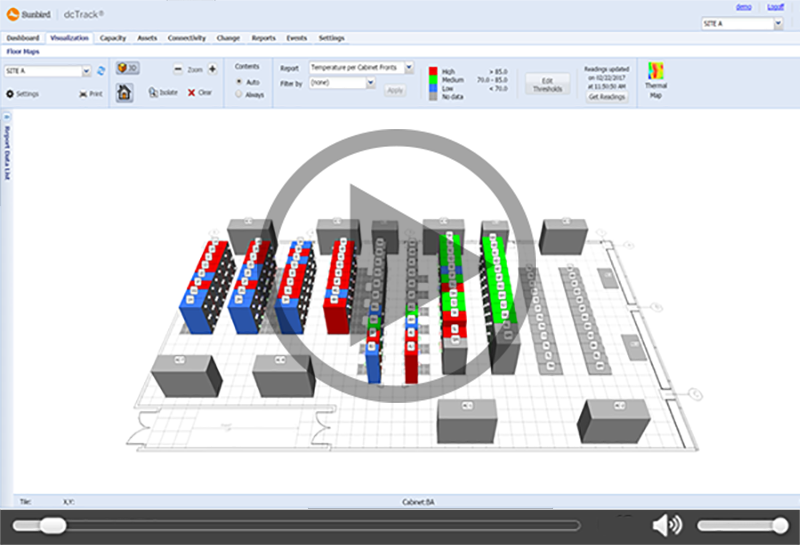 3D floor maps and thermal time-lapse video provide useful, visually interesting ways to keep track of the information in your data center.